Everything can be copied by Chinese, but there are also creative minds among the population. 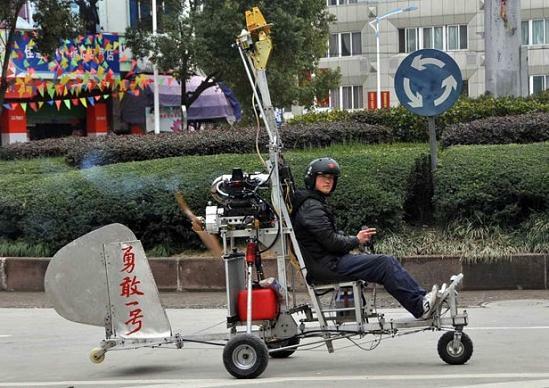 Here is a collection of some cool homemade Chinese inventions. 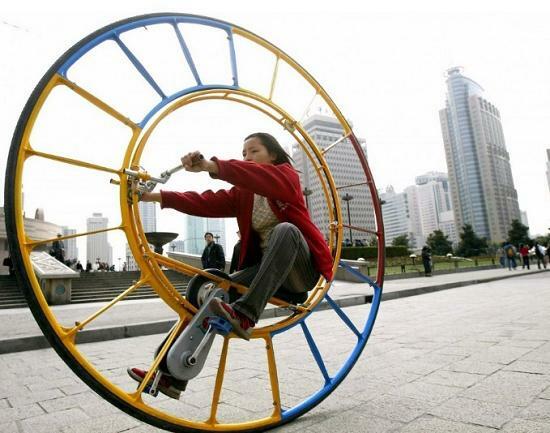 Although some of these gears may be the worst do-it-yourself inventions, Chinese inventors still keep the passion flesh in spite of setbacks and ridicule. 1. 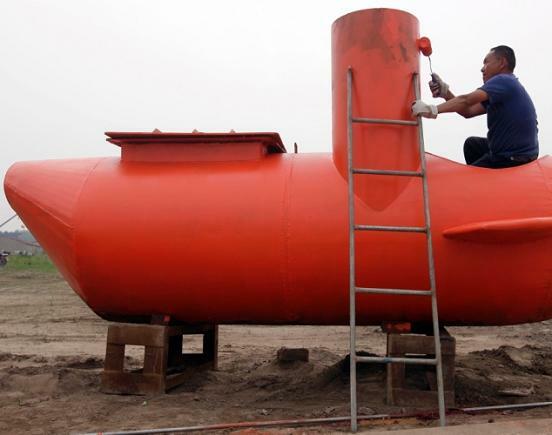 Zhang Wuyi, a Chinese farmer who is interested in inventions, waves his hand to the reporter from his self-made submarine “Shuguang Hao” after a safety test at Moshui Lake in Wuhan August 29, 2011. 2. 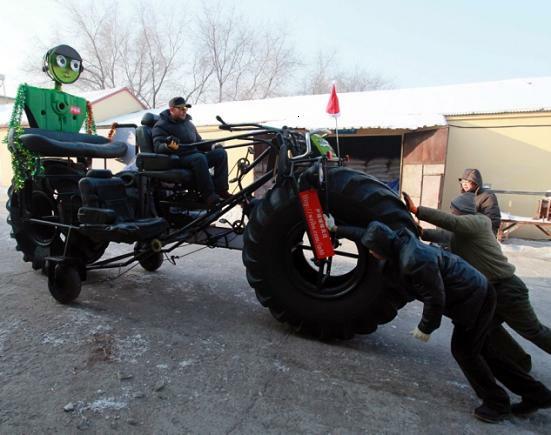 Chinese farmer Wu Yulu is driving his rickshaw pulled by a self-made walking robot in a village of Beijing on January 8, 2009. 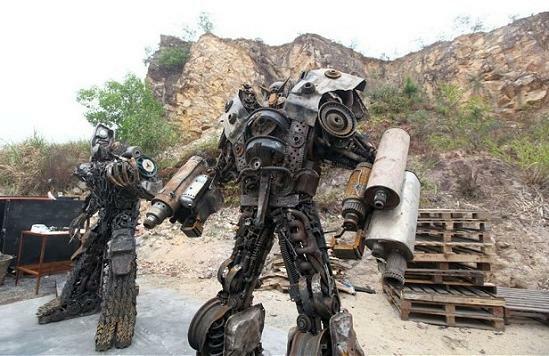 Wu started to build robots in 1986, his materials are just wire, metal, screws and nails found at dump sites. 3. 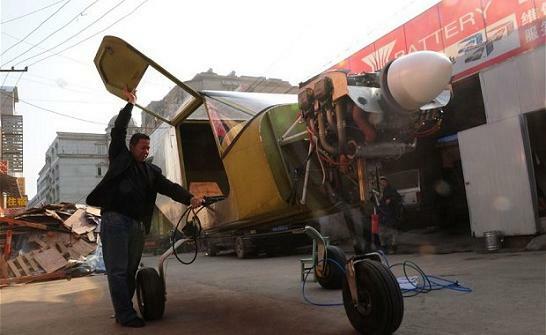 A fishing gear shop owner built his own light aircraft in Panan, eastern China’s Zhejiang province. After spending 10 months building the craft, Jiang Yonggang says it is now ready for its maiden fly. To create the plane, Jiang, 41, looked for information online and his craft is modelled on an American RAF2000 light plane. The finished craft – which has been christened Brave No.1 – is 3.1m long and 150kg in weight. 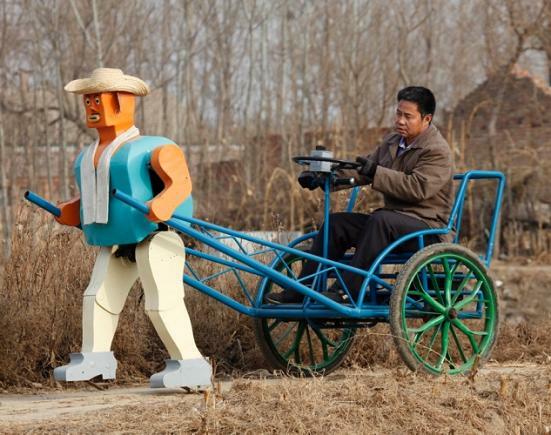 According to Jiang it costs him around 40,000 Yuan ($6,500) to build. 5. A man loves Transformers so much that he even established a company to build them. Yang Junlin set up his factory, called “Legend of Iron”, in Huizhou, southern China’s Guangdong province. Yang hired more than 10 workers in an effort to realise his dream. Over the past five years he has designed more than 1,000 different Transformers. 6. A farmer from Wuhan, capital of central China’s Hubei province, successfully flew a self-designed and homemade ‘flying saucer’. 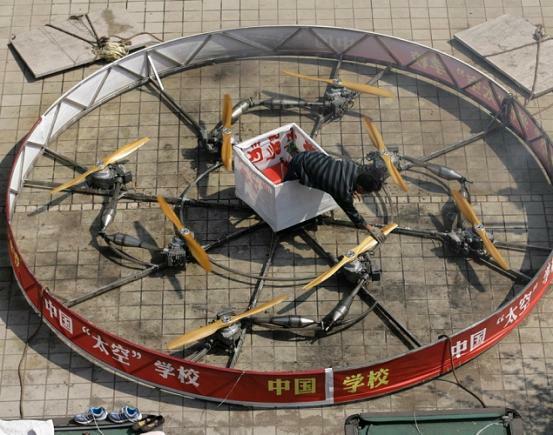 Shu Mansheng’s 4-metre diameter UFO is powered by eight motor engines, In a test fly he managed to fly it two metres above the ground for over 30 seconds. The round steel flying device, which costs more than 30,000 Yuan ($4,800) to create, is the fifth of its kind that Shu has built. 7. Li Jingchun, a 58-year-old farmer, looks toward his plane as his family members work on his self-made aircraft on top of his house in Xiahe village, Shenyang city, Liaoning province. 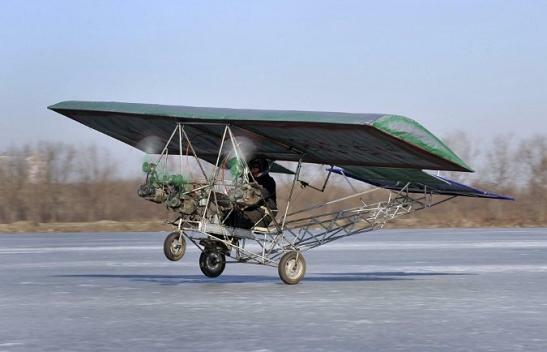 The 5m long, 1.5m wide plane, mostly made of recycled iron plates, costs the aircraft enthusiast and his family two years and more than 40,000 yuan (£6,500). 8. 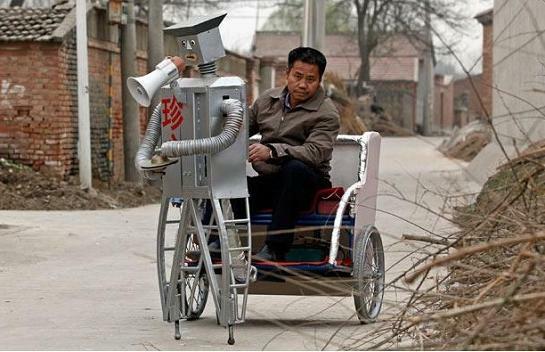 Farmer Wu Yulu, 48, is operating his walking robot near his home in a village of Beijing. 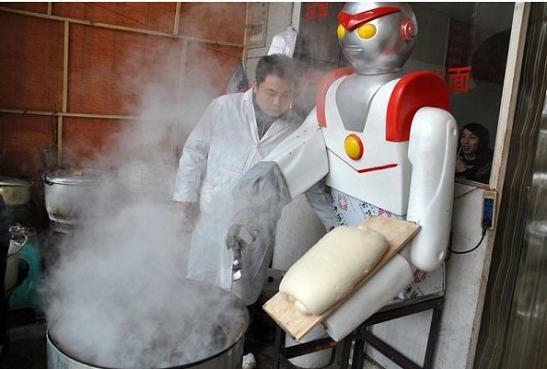 He displayed more than 30 of his robots during the Shanghai World Expo 2010. 9. A woman is rideing an unicycle at a park in Shanghai February 28, 2004. The unicycle was designed several years ago by Chinese inventor Li Yongli who called it “the number one vehicle in the world”. 11. People look at a self-made replica of Lamborghini Reventon in Suqian, Jiangsu province, August 30, 2012. 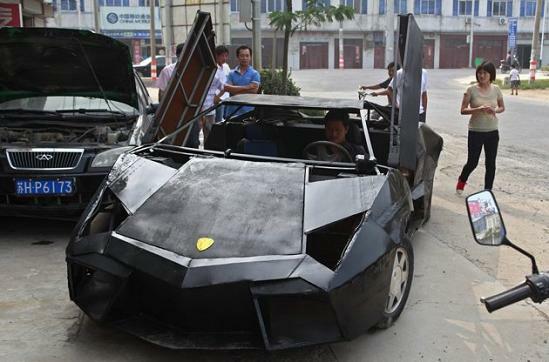 Wang Jian, who worked at a garage for more than a decade, built a replica of Lamborghini Reventon with a second-hand Nissan and Santana. This self-made roadster costs Wang around 60,000 RMB ($9,450) and can reach a maximum speed of 160mph, according to local media’s reports. Picture taken August 30, 2012. 12. 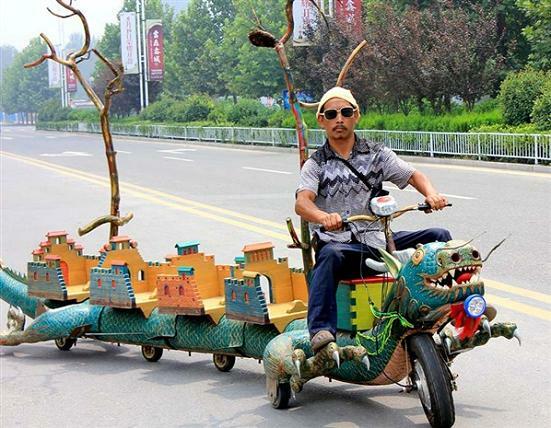 Hand-built by a man in the city of Zhoukou, in China’s Henan province, the dragon bike is seven metres long and costs the inventor five months to create. The vehicle has been designed to mimic the movements of the mythical Chinese dragon. When it moves, the tail and the claws will sway from side to side. 13. 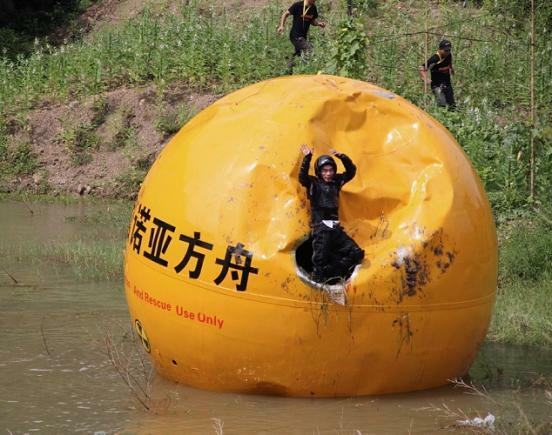 Chinese inventor Yang Zongfu made this six-ton ball named “Noah’s Ark of China.” The ball can house 3 people and will store enough food for 10 months. Yang once made headlines while testing his mobile disaster shelter. The inventor rolled down a hill, into a lake and even set it on fire. Here, he is celebrating his survival. 14. Looks like someone outgrew their tricycle! Zhang Yali tests a giant bicycle in Jinlin province, China. The bike definitely resembles a homemade batmobile. 15. 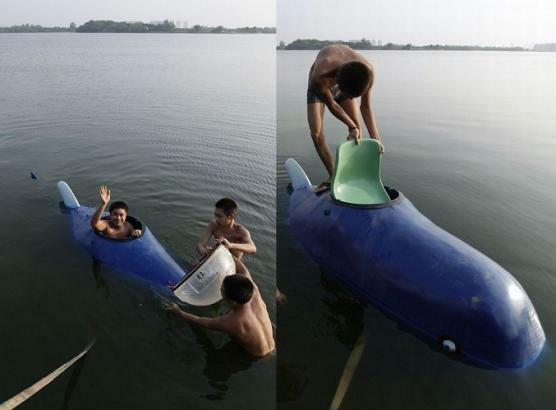 This single-seater submarine is designed by Zhang Wuyi. 16. Innovative, yes. Awesome, yes … until the entire bike sinks. 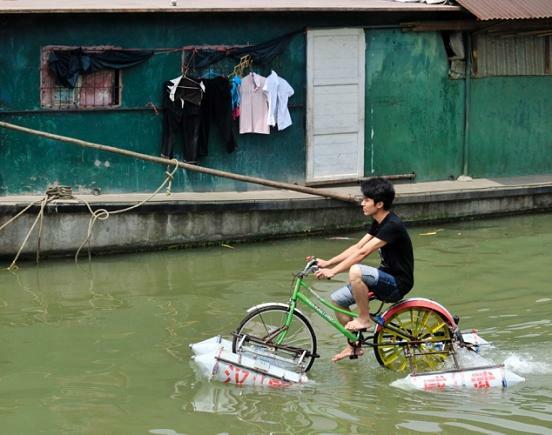 One very brave man rides a modified bike across the Hanjiang River in China. 17. This invention is dangerously cool! 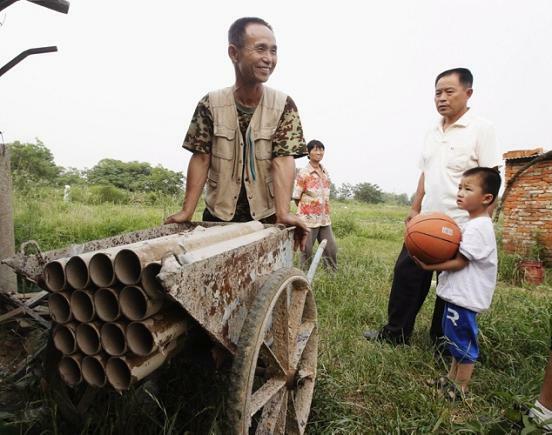 One Chinese farmer, Yang Youde, made this homemade cannon in order to defend his fields against invaders. 18. 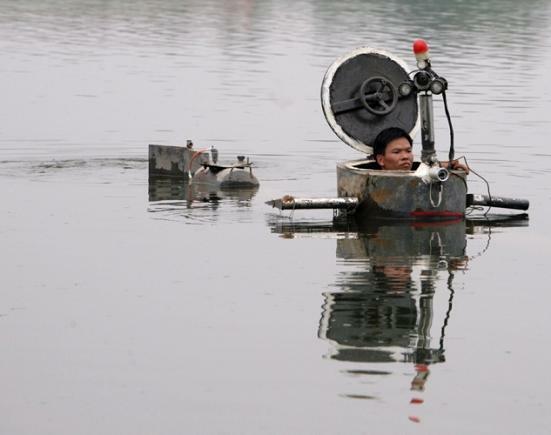 Amateur inventor Tao Xiangli takes the plunge into a lake on the outskirts of Beijing in his homemade submarine. Smartly, he keeps his head above water. 19. 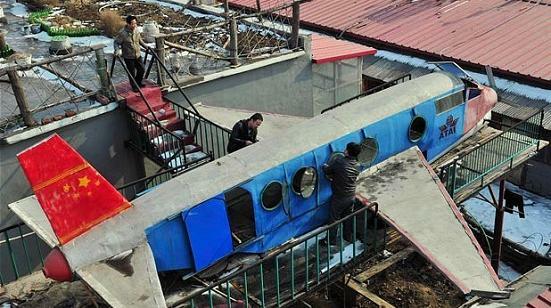 A businessman from Hefei in eastern China’s Anhui province has built his own plane. He bought more than 1,000 plane parts from America and slowly pieced them together. 20. 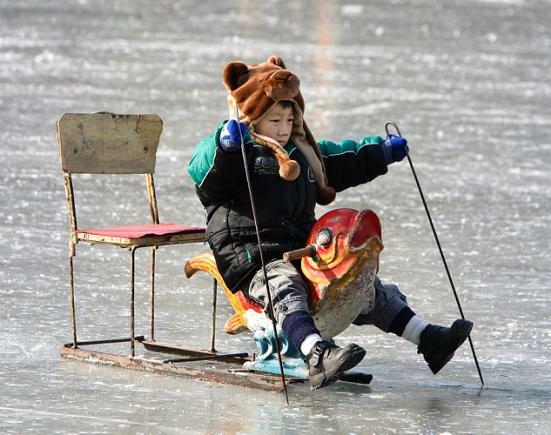 Quite simply, this “ice-chair” puts chair on ice in order to ride across frozen lakes in China. This snazzy version appeals to children with its fish seat.